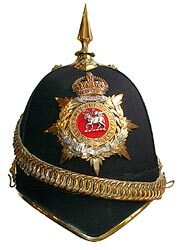 Of those regimental badges which incorporate symbols quite unique to one unit, one of the most distinctive was the Paschal Lamb device of the old 2nd (Queen's Royal) Regiment of Foot, which in 1881 became the Queen's Royal West Surrey Regiment. The Paschal Lamb was an early Christian symbol, deriving from the lamb eaten at the Jewish festival of Passover (hence "Paschal"), and in its conventional form is represented as a lamb with a halo above its head, supporting over one shoulder a flag bearing the device of St. George, a red cross upon a white field. Although used from an early period, the reason for its association with the 2nd Foot is obscure. The 2nd Foot was raised in 1661 by Henry Mordaunt, 2nd Earl of Peterborough, for service at Tangiers, a colony that formed part of the dowry of Catherine of Braganza, queen of Charles II; the regiment bore the title "Queen's" from the beginning. By tradition, the Paschal Lamb derived from the arms of the Queen's Portuguese family, but this seems not to have been the case, as a lamb does not feature in the heraldry of the house of Braganza. It may be that the lamb was associated with Catherine personally: her father, King John IV of Portugal, appears to have had St John the Baptist as his patron saint, and in depictions of St John a lamb is usually featured, and it is possible that Catherine adopted his symbol unofficially. Indeed, the portrait by Jacob Huysman in the Royal Collection shows Catherine with four lambs, although this may not be significant (it also includes a duck in the foreground, and a cherub! ), as a number of portraits of ladies of the court at that period also include lambs, although it is possible that the Queen may have set that fashion. Among other possibilities for the origin of the device, it may be that St John the Baptist featured in the decoration of the Cathedral at Tangiers, and the regiment may have taken it from its service there; indeed, considering the non-Christian enemy fought at Tangiers, a Christian religious symbol would have been appropriate for the defenders of the outpost. However, it may be that the earliest evidence for the use of the device post-dates the regiment's return to England in 1684, and it was certainly not used on the regimental Colours in the early years of James II's reign. A flag which bears three lambs and was reputedly brought to England by William III may have no relevance to the regiment, if indeed it does date from that period. In this connection, it has also been suggested that the Paschal Lamb may be derived from the arms of the Rowe family, which like some others used it as a crest, and a Henry Rowe was lieutenant-colonel of the regiment in 1689, having joined in 1682. It is unlikely, however, that a lieutenant-colonel would have been permitted to put his arms on the regimental Colours even if, as has been suggested, he was (or was connected to) a Rowe who assisted William III at the time of the "Glorious Revolution" and was rewarded by having his crest adopted as a regimental badge—a theory for which no evidence seems to exist. It may not be coincidence that the regiment was nicknamed "Kirke's Lambs" at an early period, relating to the colonelcy of Piercy (sic) Kirke (April 1682-December 1691), and 18th century sources refer to the lamb as the regiment's "ancient badge": for example, in the 1751 Clothing Warrant, in which the device is recorded as appearing in three corners of the Regimental Colour. However, the earliest surviving depiction appears to be upon two life-size "dummy boards" (painted, cut-out figures) which portray the uniform of regimental grenadiers in the early 18th century.